Think of the words 'chemistry class' and note your reaction. Now, think of a delicious food. The second image is a little more inviting, isn't it? Subha Das thought so when he decided to use cooking to teach his students chemistry. And judging by the students' enthusiasm, it was a winning idea. 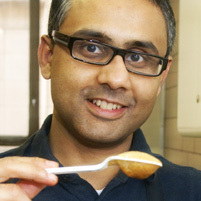 "Food is one of the few universal connectors," said Das, an assistant professor of chemistry at Carnegie Mellon University. "Food cuts across all sorts of barriers." At the same time, it is also something very tangible, he noted. For example, nearly everyone knows oil and water don't mix. "The same principle also explains why DNA is stable as a double helix," he explained. "Essentially, I developed the course to make science palatable." 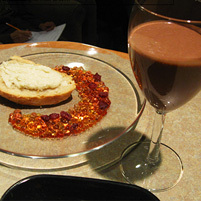 Lab assignments range from 'Fruit Juice Caviar' to 'Chocolate Chantilly' (mousse). And students often surprise Das with their own concoctions. The chemistry department and Das's Kitchen Chemistry students are showcasing the subject and their novel food preparations at this year's Geek Arts/Green Innovators Festival. Their "Taste of Chemistry" exhibit takes place on April 1 from 6-9 p.m.
"I think because we examine the ingredients and the molecular basis of the process, rather than a specific recipe, students can really use their knowledge in creative ways," Das said. That doesn't always work out according to plan. Consider the chocolate mousse, that can be whipped up in ten minutes with any flavored liquid of choice. One group chose hot sauce. "It was a good idea; chocolate and chile are a well known combination, going back to the ancient Mayans. The downside of this particular preparation we learned, however, was that because it was hot sauce it has a lot of vinegar," Das said. "So to the students' surprise, the result in this case was a 'vinegar' chocolate mousse with a lingering blast of heat at the end. Still, it was a good lesson in testing hypotheses through an experiment." Usually, however, the experiments and the students' final projects are quite tasty. "The students have made tasty banana marshmallows with honey foam and a bite-sized BLT that had the bacon fat in powder form," Das said. 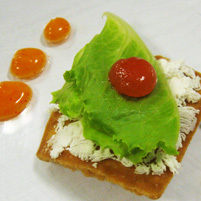 "There was also a dessert 'sushi' that was made with strawberry sheets instead of seaweed. Vegan chocolate cake with raspberry pearls. It's a long list. I can keep going..."